Jesus’ boat lands on the eastern shore of the Sea of Galilee—no longer in Jewish territory. This is like landing in Cuba. Along the edge of the lake, tombs are cut into the mountain. The village graveyard is this land’s version of a mental institution. In Mark’s Gospel, the story takes place at night. This place would have been spooky even in broad daylight. At night, it must have been terrifying. A howling man runs out of the tombs to greet them. He has been buried alive, banished to die in the cemetery. The first-century world was different. Whatever we think about demons, they were intensely real to these people. Demons were responsible for every physical ailment. One Jewish rabbi estimated that there are seven and a half million demons. They believed that demons lived in unclean places like the graveyard, and drowning was the primary way to destroy them. Demons were especially dangerous to women in childbirth, children who were out after dark, and the newly married. The ancient ideas may seem silly, but when the biblical writers speak of being possessed by demons, they use strikingly appropriate terms. Modern psychology has given the old demons new names like “paranoia” and “schizophrenia,” but the old names correspond more closely to what people feel. Deeply conflicted people do not feel like they have a chemical imbalance. They feel possessed by a power that has taken control. When we are depressed, we do not feel like we have a vitamin deficiency; we feel overwhelmed. Some mental illnesses can be effectively treated, and some cannot. With medication, many people can function well as physicians, accountants, and teachers. Others are possessed by what seems to be a legion of demons. Everyday life proves too much, and finally the family decides to send the afflicted person to a place where he or she can receive proper, constant care. The Gerasenes sent their mentally ill to the cemetery. This person is so pulled apart that he feels like a mob of a thousand. If a story this peculiar can have a most peculiar part, it is the detail about the pigs. As the man screams, a herd of pigs stampedes into the lake. Commentators suggest that the man’s yelling frightens the swine, and they become the proof that he needs. He would never have believed that he was cured without visible evidence. The people come to take a look and find the former mental patient sitting at the feet of Jesus. We might guess that the Gerasenes would invite Jesus to stay, but they ask him to leave at once. Jesus, who was often willing to shake the dust off his feet, gets back into the boat without a word and prepares to set sail. The healed man looks at Jesus and then at the crowd who had banished him to the graveyard. “Please, let me go with you!” he pleads to the Lord. There is room in the boat. This man will leave without looking back. There is no one who has not already told him good-bye. The man goes and tells how Jesus put his life back together. An evil spirit destroys the hope of a single purpose by pulling us in a thousand directions. We want this and that and the other thing. We constantly have to choose between work and home, this commitment and that one, helping others and taking a break, what we want to do and what we need to do, what is good and what is better. We don’t want to focus on one thing. Making up our minds is hard. Do you ever think you should have been a doctor or a cowboy or a talk show host? Do you have troubling ordering in restaurants? No matter what you order, do you catch yourself looking at what other people are eating and then wondering if you made a mistake? Does it take you thirty minutes to choose a flavor at Baskin-Robbins? Do you end up eating your butter brickle and wishing it were rocky road? We are constantly forced to do this or that but not both. We feel like we should start jogging and read the best-sellers and meditate thirty minutes a day and learn French and cook healthier meals. We want to be good employees, good friends, good neighbors, and a good deal more rested than we are. We want to be Christians, and we want to be a lot of other things, too. God offers the grace that holds our lives together. If we center our lives in God, then love becomes the criterion by which we choose. God makes grace the Maypole around which everything dances. In his right mind, the healed man sits at the feet of Jesus. Letting God teach us to love is a step toward sanity. When life is good and we have a dozen options in front of us, we need God’s grace to sort through the possibilities. When life is hard and we have a dozen difficulties to deal with, God’s love makes sense of them. When we eat the bread of hope, God offers love that gives direction. When we drink the cup of thanksgiving, we promise that the grace of God will hold us. 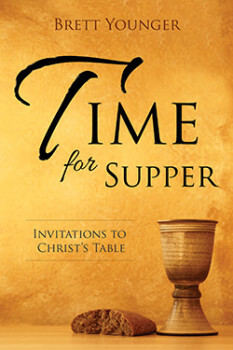 This post originally appeared in Time for Supper: Invitations to Christ’s Table by Brett Younger. Brett Younger is the Associate Professor of Preaching at the McAfee School of Theology at Mercer University in Atlanta. He teaches preaching, worship, and writing. Dr. Younger previously served as a pastor for twenty-two years in Texas, Kansas, and Indiana. He is the author of Who Moved My Pulpit? and The Lighter Side. He and his wife Carol co-authored Mark: Finding Ourselves in the Story. Brett and Carol have two mostly grown sons, Graham and Caleb.